Eczema is an inflammatory skin condition which is estimated to affect over 30 million people across the United States. Characterized by itchy, dry, scaly patches of skin, it can be a source of both annoyance and social discomfort for many, and in severe cases, patches may become raw and painful. Affecting about three percent of the nation’s adult population, eczema is more common in infants and young children, up to 20 percent of whom suffer from the scalies. The most common flare-up sites are on the hands, feet, wrists, face and the backs of the knees, although it can appear anywhere. While most children tend to outgrow it by about age 10, some people suffer their entire lives. The most prevalent type of eczema is known as atopic dermatitis, which is often genetic in nature, and is related to your susceptibility to allergic reactions. It is generally known as an autoimmune disorder, as the skin reacts to irritating agents by becoming inflamed. The exact cause is often unknown. Eczema can also accompany other conditions, such as allergies to foods, household products, animals and other environmental factors (both internal and external). Some people experience symptoms in response to extreme temperatures, either hot or cold, and some get an outbreak when they are under stress. Others, however, have it year-round and seemingly at random. Since eczema appears on the skin, many people attempt to treat it as a skin disorder, only addressing the outer symptom. However, due to the delicate nature of eczema and its connection to inflammatory immune response, this is definitely a condition to be tackled from the inside out. Many topical remedies do not address the underlying cause of eczema, and therefore do not work, or only work for a short time. As the root culprit behind eczema is inflammation, it may be triggered or worsened by something you are putting into your body. For many people, making certain dietary changes does a world of good, and in some cases, eliminates the problem completely. To start, take note of the things that you are eating that may be contributing to inflammation. Sugar and wheat are inflammatory in nature, and cutting these out is an important first step. If you are sensitive to gluten, eliminating foods that contain it from your diet is key. If you are not sure, try going gluten-free for two weeks to see how you feel, and how your skin behaves. Note: gluten is found in wheat, barley and rye. Processed foods contain an array of chemicals, preservatives and emulsifiers, as well as multiple added sugars, that may be significantly pro-inflammatory. For your overall health, and your eczema, these items do not belong on the menu. As a general rule, anything that comes from a factory, contains more than five ingredients, or has ingredients you cannot pronounce, does not contribute to your health, and instead significantly deters from it. One common eczema trigger is lactose, found in milk and dairy products. While not always the case (and grass-fed, organic milk is quite healthy), cutting dairy from your diet for two weeks to see if it is contributing to the problem is worthwhile. This experiment works better after processed foods, sugars and gluten have already been cut out, so you know that dairy is the problem if you experience relief without it. Instead of foods containing sugar, wheat and processed foods, dine on a rainbow of fruits and veggies, healthy fats such as avocados and organic, extra virgin coconut oil (which is wonderfully anti-inflammatory in nature), and proteins including grass-fed meats, wild-caught fish, beans and lentils. For eczema sufferers, choosing organic whenever possible is especially vital, as pesticide residues may trigger outbreaks in sensitive individuals. Wild caught fish, as well as vegan sources such as flax seeds and hemp seeds, are especially key because they are high in anti-inflammatory omega-3 fatty acids. Omega-3s, along with supporting heart and brain health, are important in helping keep skin moist from the inside. Probiotic foods, such as natural yogurt, kefir, sauerkraut, kombucha and kimchi, are also a smart dietary addition, as they help restore and support healthy gut bacteria, which is imperative to a healthy immune system. Another secret weapon in your anti-eczema arsenal is bone broth. When simmered for long periods of time, bones release natural gelatin, which is very soothing to the gut, is excellent for supporting healthy skin, hair and nails, and is also very good for other bodily systems, including the kidneys and immune system. Make sure the bones you are using are from pastured, grass-fed animals, as these contain more nutrients, and are not exposed to antibiotics and synthetic growth hormones. Many people who have switched their diets to nutritious foods and still get eczema outbreaks may be quite puzzled, and the answer is often what you are putting on your skin. The chemicals that lurk in conventional soaps, lotions, sunscreens and laundry detergents may all be aggravating your eczema. There are over 80,000 chemical ingredients used in personal care products in the United States, and frighteningly, only 500 or so have been tested as to their effects. One of the most detrimental of these ingredients when it comes to eczema is sodium lauryl sulphate (SLS) – the chemical which makes your soaps and shampoos foam and lather. This ingredient is known to potentially lead to skin irritation, and even severe allergic reactions and corrosion in some cases. Take a look at the ingredient label of your shampoo or body wash – chances are, it’s there. Instead of trusting your skin to these largely untested chemicals, switch to pure castile soaps for your skin, or make your own organic soap. You can also make many other products, from shampoos to sunscreens, at home using just a few simple ingredients. Since your clothes are in contact with your skin all day long, switching to natural fibers such as organic cotton, and ditching the synthetic fabrics, may greatly ease skin irritation. The same goes for bedsheets and pillowcases. As chemical laundry detergents – especially scented ones – can leave a residue on your clothes, switching to a free and clear organic variety, such as castile soap or soap berries is key. On top of making the above-described changes, there are many natural topical solutions to help clear up existing eczema. Keep in mind that different things work for different people, as no two eczema cases are exactly the same, and it may take a bit of trial and error to find the perfect recipe for your skin. Once again, it’s organic, extra-virgin coconut oil to the rescue. Not only is this oil great for cooking (or spreading, blending with coffee, etc. ), it can also work wonders for your skin. Coconut oil is an excellent, light moisturizer for any skin type and is safe even for babies and young children – anyone who does not have a coconut allergy. It even has a mild SPF, and can offer a bit of sun protection when you only need a little. This multifaceted oil is great for eczema because it lets skin breathe, both moisturizing and letting the patches receive oxygen at the same time. Make sure skin is clean and dry before applying. A little bit of coconut oil goes a long way, so don’t overdo it. Also, make sure you have a high-quality, organic product, as coconut oils are sometimes high-heat processed and hydrogenated, which destroys many of their health benefits. To learn about more great ways to use coconut oil click here. The gel encased within the leaves of the aloe vera plant can do so much more than just soothing sunburn. It is known to help accelerate wound recovery, promote new cell growth, and has antibacterial, antifungal and antiviral properties that help guard against infection. However, don’t trust an aloe vera gel in a plastic tube – many of these products contain chemical additives your skin does not need, and which can worsen your eczema. Your best option is to purchase a plant for your home. When you need to use it, simply cut a leaf and slather on the gel inside. You can put a leaf in the refrigerator for later use if you do not use all of the gel in one go. Aloe vera juice can also be taken internally, as it contains a wide array of vitamins, minerals and antioxidants, eases digestion and promotes healthy gut bacteria. These properties make it a great addition to a detox. However, talk to a natural health professional before going this route. It is important to determine your dosage (as too much over too long of a time period may lead to toxicity) and to find a quality, pure product that does not contain additives. Just as eating hemp seeds, the seeds of the cannabis sativa plant (which does not contain THC, unlike its cousin, marijuana), can provide a high concentration of omega-3 fatty acids which nourish your body from inside, applying pure hemp oil to your eczema offers potent anti-inflammatory benefits. This oil is easily absorbed into the skin, provides moisture and enriches the skin with antioxidants. Like coconut oil, it allows your skin to breathe while moisturizing. 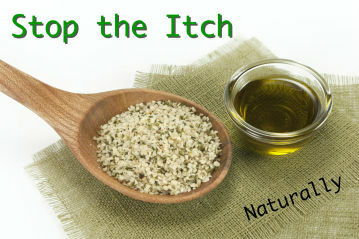 For many eczema sufferers, hemp oil may greatly help to relieve the itch, dryness and swelling of the condition. Individuals with mild eczema may find that their skin responds well to lavender essential oil, which is very gentle and soothing by nature. It also has the added benefit of stress relief, and breathing its aroma may greatly help to soothe your anxiety, and if this is contributing to your eczema outbreaks, this is good news. To use, mix a few drops into a dollop of organic, extra-virgin coconut oil and apply to eczema for daily use. At night, mix with grapeseed oil, cocoa butter or shea butter for heavier moisture. Make sure that the essential oil you choose is pure and therapeutic grade to avoid exposure to additives and perfumes. Another essential oil that may work for some if lavender does not do the trick is frankincense, which is derived from the resin of the frankincense tree. This oil is also great for stress relief when used as aromatherapy, and is perfect for a meditation session. Always mix with a carrier oil, such as coconut or grapeseed oil, cocoa butter or shea butter. Notes: Do not apply essential oils to broken, oozing skin. These work best with mild eczema, and may irritate more serious cases. If you find that an essential oil aggravates your symptoms, stop using it immediately, as everyone’s eczema is different. In addition, certain essential oils, like lavender and frankincense, are not recommended for pregnant women. Lavender is not recommended for breastfeeding women or individuals with very sensitive skin, because it can cause allergic reactions. If you have tried the suggestions mentioned in this article and are still not experiencing relief, it may be time for a visit to a natural health professional to create a personalized strategy for your individual condition, without resorting to chemical prescription medications. However, if your eczema is severe, bleeding or oozing, see a doctor. If skin in this state is not dealt with quickly, it may result in a serious infection. Once it is under control, however, the dietary changes and banishment of household chemicals we outlined above may help ensure that it does not return. Hey Buddy!, I found this information for you: "Natural Home Remedies for Eczema – From the Inside Out". Here is the website link: https://www.thealternativedaily.com/natural-home-remedies-eczema-inside/. Thank you.